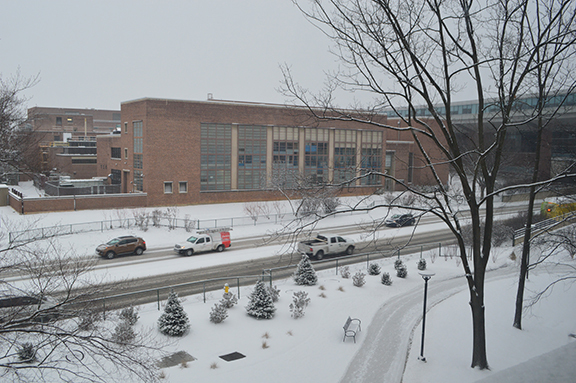 Snowy day on campus: a view from Walker Building looking toward west campus across Atherton Street. The building in the center of the image is the Garfield Thomas Water Tunnel. Melissa Wright is receiving the American Association of Geographers Harold M. Rose Award for Anti-Racism in Research and Practice. Alumna Vanessa Massaro (’16g) has accepted a position as an assistant professor of geography at Bucknell University. Jiayan Zhao is co-author with alumnus Rui Li (’12g) on a paper accepted by the German Artificial Intelligence Journal, KI – Künstliche Intelligenze. Alumna Helen Poulos (’02g) is quoted and one of Alan Taylor’s photographs is used in an article on Seeing Science about how photographic images influence perceptions of ecological issues. In this coffee hour, Jonathan Rush will introduce a cyberGIS-enabled project to better understand past interactions of human and natural systems. The environments of the past cannot be assumed to be fixed, or equivalent to today’s conditions. Shifting spatiotemporal patterns of settlement, land use, and climate can be important factors in understanding the contexts under which historic and prehistoric societies operated. However, data on these conditions can be difficult to discover and interpret. SKOPE, Synthesizing Knowledge of Past Environments, is being designed to fill this need. The Big Ten Academic Alliance (BTAA) Geospatial Data Portal Project, of which Penn State University Libraries is a contributor, has launched an online spatial data discovery tool called the Big Ten Academic Alliance Geoportal. The project and geoportal aim to provide discoverability, facilitate access and connect scholars across the Big Ten Academic Alliance to often scattered geospatial data resources. Forests and tree-based systems are an important component of rural landscapes, sustaining livelihoods and contributing to the food security and nutritional needs of hundreds of millions of people worldwide. Historically, these systems developed under a wide variety of ecological conditions, and cultural and socio-economic contexts, as integrated approaches that combined management of forest and agricultural areas to provide primarily for the needs of producers and their local communities. Today they serve food and nutrition demands of growing global populations, both urban and rural. Abandoned cropland (ACL) is often cited as a land resource upon which to produce energy crops while reducing the negative impacts of broad scale energy crop production; for example, carbon emissions from land-cover change and competition with food production. In contrast to marginal land which refers to a set of biophysical and economic criteria usually imposed by experts or policymakers, the designation of ACL refers to a land-use decision by a land owner. As such, ACL is argued to be a more appropriate indication of land availability for dedicated energy crop production. Prevailing estimates of ACL in the US vary widely due to inconsistent treatment of land-use conversions away from cropland and over-reliance on remote sensing methods which measure land cover, even though ACL is a category of land use. This paper develops and applies a replicable and flexible methodology to estimate available abandoned cropland (AACL) at the county level in the United States, which accounts for conversion of ACL to forest cover, urban development or permanent pasture. Estimates of AACL are derived for two scenarios: 1) land abandoned between 1978 and 2012, which excludes lands with meaningful forest regrowth; and 2) land abandoned between 2007 and 2012, which corresponds to land-use constraints imposed by the Renewable Fuel Standard. Results show that 15 and 4.9 Mha of AACL exist in the United States in the two scenarios respectively, amounting to between only 3 and 8 percent of total light duty gasoline consumption in the US. The policy implications of these findings and the need for future research are discussed. 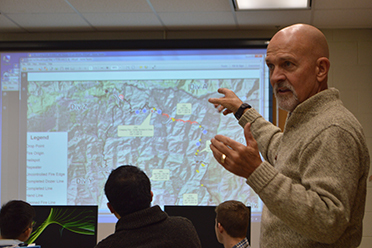 Alumnus James McCrory (’73), a helicopter pilot for Aspen Helicopters (a US Forest Service contractor), visits Cynthia Brewer’s GEOG 467 Applied Cartographic Design class to show how maps are used in fighting fires. Alumnus Mario Machado’s (’16g) article, “President Obama’s Human Goodness Will Be Sorely Missed,” appears in the January 20 edition of the The Huffington Post. Since the Dayton Agreement brought an end to formal hostilities in Bosnia-Herzegovina (BiH), international organizations and intergovernmental agencies have expended considerable effort and funds to promoted new ways of being as citizens. Young people have been the focus of many of these efforts, reflecting concerns that youth are particularly susceptible to the negative influence of ethno-nationalism, but also beliefs that this generation offers the best chance for change. In striving to provide alternative frames of belonging outwith ethno-nationalism, youth citizenship projects aim to instill habits of cosmopolitanism in everyday practices. Drawing on John Dewey’s ideas regarding the habits of citizenship, the paper traces the complex geography of citizenship that international organizations attempt to construct and that young people navigate. The effects of human-caused climate change both locally and throughout the world will be discussed by University experts during the next episode of WPSU Penn State’s “Conversations LIVE.” The live broadcast, which encourages community input and interaction between viewers and guests, will air at 8 p.m. on Thursday, Jan. 26, on WPSU-TV, WPSU-FM and online at wpsu.org/live. Citizen-led movements producing scientific hazard data during disasters are increasingly common. After the Japanese earthquake-triggered tsunami in 2011, and the resulting radioactive releases at the damaged Fukushima Daiichi nuclear power plants, citizens monitored on-ground levels of radiation with innovative mobile devices built from off-the-shelf components. To date, the citizen-led Safecast project has recorded 50 million radiation measurements worldwide, with the majority of these measurements from Japan. The analysis of data which are multi-dimensional, not vetted, and provided from multiple devices presents big data challenges due to their volume, velocity, variety, and veracity. While the Safecast project produced massive open-source radiation measurements at specific coordinates and times, the reliability and validity of the overall data have not yet been assessed. The nuclear disaster at the Fukushima Daiichi nuclear-power plant provides a case for assessing the Safecast data with official aerial remote sensing radiation data jointly collected by the governments of the United States and Japan. This study spatially analyzes and statistically compares the citizen-volunteered and government-generated radiation data. Satellite-based near-surface (0-2cm) soil moisture estimates have global coverage, but do not capture variations of soil moisture in the root zone (up to 100 cm depth) and may be biased with respect to ground-based soil moisture measurements. Here, we present an ensemble Kalman filter (EnKF) hydrologic data assimilation system that predicts bias in satellite soil moisture data to support the physically based Soil Moisture Analytical Relationship (SMAR) infiltration model, which estimates root zone soil moisture with satellite soil moisture data. The SMAR-EnKF model adds a regional-scale estimated bias parameter, which is estimated using available in situ data. The regional bias parameter is added to satellite soil moisture retrievals before their use in the SMAR model, and the bias parameter is updated continuously over time with the EnKF algorithm. The SMAR-EnKF is used to assimilate in situ soil moisture at 43 Soil Climate Analysis Network (SCAN) monitoring locations across the conterminous U.S. Multivariate regression models are developed to estimate SMAR parameters using soil physical properties and the moderate resolution imaging spectroradiometer (MODIS) evapotranspiration data product as covariates. The mitigation and response to floods rely on accurate and timely flood assessment. Remote sensing technologies have become the de facto approach for observing the Earth and its environment. However, satellite remote sensing data are not always available, and it is crucial to develop new techniques to complement them with additional sources. This research proposes a new methodology based on machine learning algorithms to automatically identify water pixels in Civil Air Patrol (CAP) aerial imagery. Specifically, a wavelet transformation is paired with multiple classifiers to build models that discriminate water and non-water pixels. The learned classification models are first tested against a set of control cases and then used to automatically classify each image separately. Lastly, for each pixel in an image, a measure of uncertainty is computed as a proportion of the number of models that classify the pixel as water. The proposed methodology is tested on imagery collected during the 2013 Colorado flood. Coffee Hour with Derek Alderman | Glacial melt trickle-down | Conservation v. livelihoods? 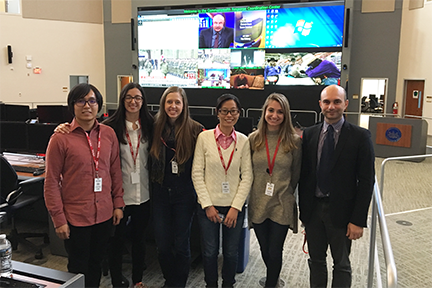 The members of the Geoinformatics and Earth Observation Lab visited the Pennsylvania Emergency Management Agency (PEMA) in Harrisburg to establish a collaboration to use social media during emergencies. Pictured (left to right): Weiming Hu, Martina Calovi, Carolyn Hultquist, Liping Yang, Elena Sava, Guido Cervone. Jennifer Baka has been selected as an Early Career Representative of the Water-Energy-Food Nexus Knowledge Action Network for Future Earth. The team will be responsible for designing approaches and facilitating research to advance sustainability research. Christopher Fowler was quoted in WalletHub’s recent piece about 2017’s most and least recession-recovered cities. Over the past twenty years or so, I have researched the politics of naming America’s streets for Martin Luther King, Jr (MLK). These roadways, which represent the most widespread and contentious memorials to King, have proven to be important sites for understanding the politics that continue to surround the civil rights leader’s reputation and legacy. Although King has become an internationally recognized icon, there remains considerable debate about not only whether and how to honor him but also where—and on which street—that remembering should happen. These locational struggles speak to broader racialized fights for public space and belonging in American cities and opposition has frequently led to a social and spatial marginalization and segregation of King’s memory. I conceptualize MLK streets as not only monuments to the Civil Rights Movement but also extensions of the ongoing, unfinished struggle for civil rights—recognizing that geographies of naming and memorializing are inseparable from a consideration of the material conditions, inequalities, and legacies of violence within our society. Conservation and logging groups in Central and West Africa are failing to fully incorporate local concerns into management, marginalizing the livelihoods of the local population, according to Nathan Clay, doctoral candidate in geography, Penn State. Austin Brown won third place in the 2016 EMS Undergraduate Student Poster Exhibition. 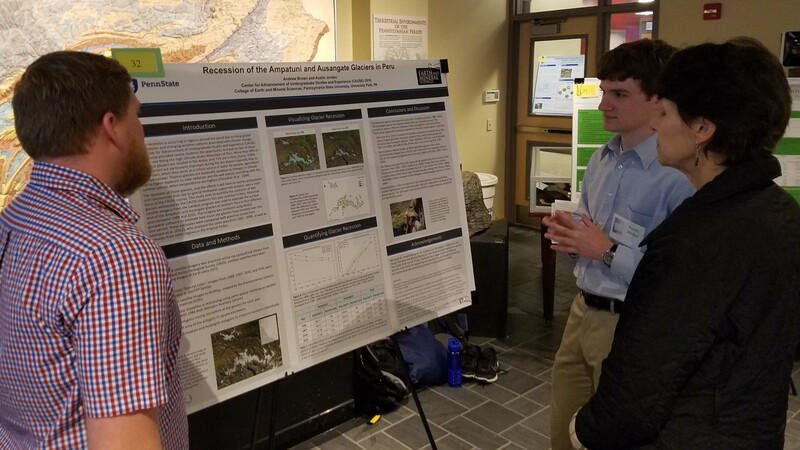 His team’s entry was, “Recession of the Ampatuni and Ausangate Glaciers.” Denice Wardrop, Mike Nassry, and Joe Bishop were the project advisers. You can see his CAUSE digital story on the department homepage. Brian King’s article, “How bucking climate change accord would hinder fight against HIV/AIDS” has been published on The Conversation. Lauren Fritzsche was elected as the new graduate representative. She joins Ramzi Tubbeh, E.-K. Kim, and Peter Koby as the department’s graduate representatives. Her term will run from January to December 2017. Guido Cervone received NCAR visitor funding. Laura Clemente-Harding received an NCAR ASP scholarship. Supporting Women In Geography exceeded its donation goal and were able to sponsor an additional family through Centre County Women’s Resource Center. 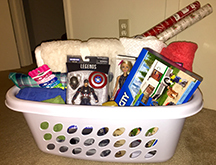 A family of three and a family of four received holiday baskets. Left, a picture of one of the baskets. Spring semester Coffee Hour will begin on January 20 with Derek Alderman speaking about MLK streets as monuments to the Civil Rights Movement and also extensions of the ongoing, unfinished struggle for civil rights. Two Miller Lectures will be held this semester. The first, with Lynn Staehelli, will be on January 27. The second, with Tonny Bebbington, will be on April 14. The list of speakers can be found on the department website. Details about each talk are added as they are confirmed. Coffee Hour is the Department of Geography’s ongoing Friday lecture series. Coffee Hour has been held during the spring and fall semesters since 1968. The National Science Foundation has named William E. Easterling III, professor of geography and dean of Penn State’s College of Earth and Mineral Sciences (EMS), to serve as director for the Directorate for Geosciences (GEO) in Washington D.C., which supports fundamental research spanning the atmospheric, earth, ocean and polar sciences. Easterling will step down as dean on May 31, 2017, and will begin his four-year NSF appointment on June 1, 2017. He will remain a member of the Penn State faculty during the four years with NSF. Though it was abolished more than two decades ago, Apartheid continues to affect communities in South Africa. In this political system, which lasted from 1948 to the 1994 democratic elections, people were racially classified and forced to live in segregated geographic areas. Within rural South Africa, these spatial containers were called “homelands,” or Bantustans. Food environment characterization in health studies often requires data on the location of food stores and restaurants. While commercial business lists are commonly used as data sources for such studies, current literature provides little guidance on how to use validation study results to make decisions on which commercial business list to use and how to maximize the accuracy of those lists. Using data from a retrospective cohort study [Weight And Veterans’ Environments Study (WAVES)], we (a) explain how validity and bias information from existing validation studies (count accuracy, classification accuracy, locational accuracy, as well as potential bias by neighborhood racial/ethnic composition, economic characteristics, and urbanicity) were used to determine which commercial business listing to purchase for retail food outlet data and (b) describe the methods used to maximize the quality of the data and results of this approach. Several every-day cartography applications do not require sharply precise base maps, and in fact benefit from their generalization or deliberate obscuration, such as tourist or transit maps. Additionally, raster data fine enough for a given map scale are not always available. We present a method of creating an impressionistic land cover base map for topographic mapping in which the above two conditions are true, using the National Land Cover Database (NLCD) of the US Geological Survey (USGS). The method is based on reclassification, upsampling, constrained randomization at class boundary edges, and deliberate use of colors with very similar lightness values. The method spans both scientific geospatial data treatment and artistic cartographic design, and both generalizes and enhances the data. The processing, automated in ArcGIS™, is detailed, and examples of the product are provided. Agricultural commercialization has been slow to take hold in mountain regions throughout the world. It has been particularly limited by challenges of mechanization, transportation access, and governance. Efforts at green-revolution style development have met with persistent failures in highland sub-Saharan Africa, where agricultural systems are often finely tuned to complex and dynamic social–ecological contexts. In Rwanda, a mountainous country in east central Africa, development efforts have long aimed to transition away from largely subsistence-based production that relies on high labor input toward commercial farming systems that are rooted in capital investment for marketable goods. Since 2005, Rwanda’s land policy has become increasingly ambitious, aiming to reduce the 85 percent of households involved in agriculture to 50 percent by the year 2020. The country’s Crop Intensification Program (CIP) compels farmers to consolidate land and cultivate government-selected crops. Although state assessments have touted the productivity gains created through the CIP, others speculate that households could be losing access to crucial resources. Research from both sides, however, has focused squarely on the CIP’s immediate successes and failures without considering how households are responding to the program within the context of the complex and variable mountain environment. Drawing from political ecology and mountain geography, this article describes recent state-led agricultural commercialization in Rwanda as a partial and contested process. By analyzing complex land-use and livelihood changes, it fills an important conceptual and empirical research gap in understanding the environmental and social dynamics of the agrarian transitions of the highlands of Africa.